Hello everyone, and welcome to #Day58 in our #DisneyWorldCountdown! Today we’re taking a look at a show over at Disney’s Hollywood Studios — Voyage of the Little Mermaid! This is a unique show in that it tells the story of Ariel from both a live acting perspective as well as an animation perspective. We all probably know the story of Ariel, the Mermaid princess who fell in love with Eric. The only problem was that Eric was a human, not a Merman! Day after day Ariel longed to be able to meet him, to experience life on land, but to no avail — until Ursula the Witch gave her legs in exchange for her voice! Ariel and Prince Eric, with King Triton animated. The Voyage of the Little Mermaid isn’t a show that we see on every visit to Walt Disney World, but it is one that we’ll see every couple of years. If you like the story of the Little Mermaid, I urge you to check it out if you haven’t yet, especially if you have young Princesses of your own that love Ariel! 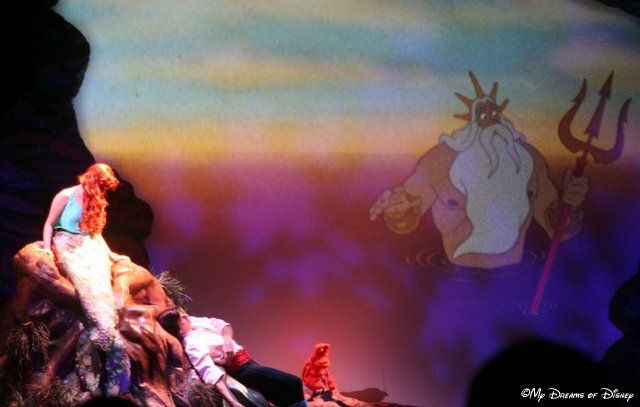 Do you and your family stop by to see Voyage of the Little Mermaid, or do you skip it? Let me know in the comments, and tell me what your favorite part of the show is! 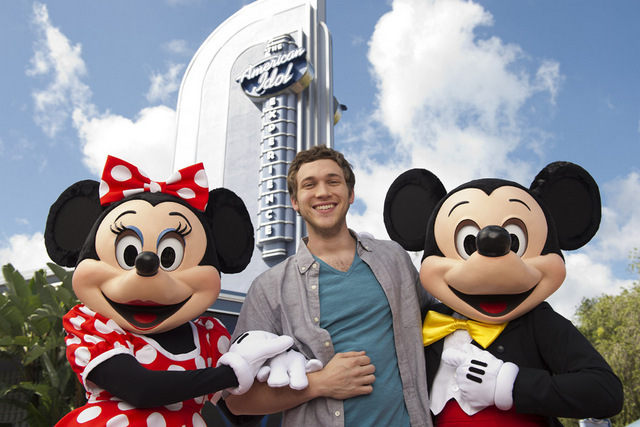 Thanks, now go out and make today a great Disney Day! 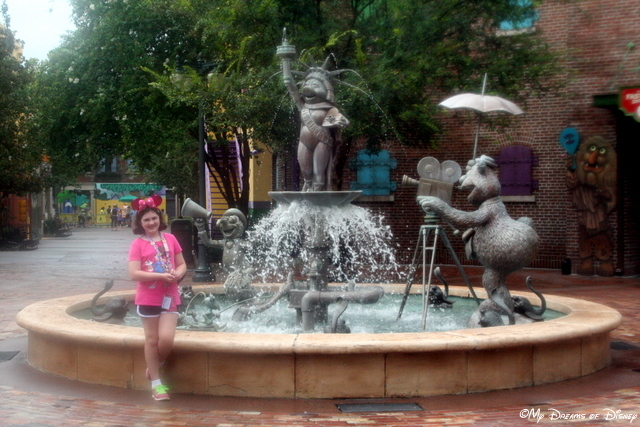 In a new series, today I’m taking a look at all of the different shows throughout the Walt Disney World Parks. 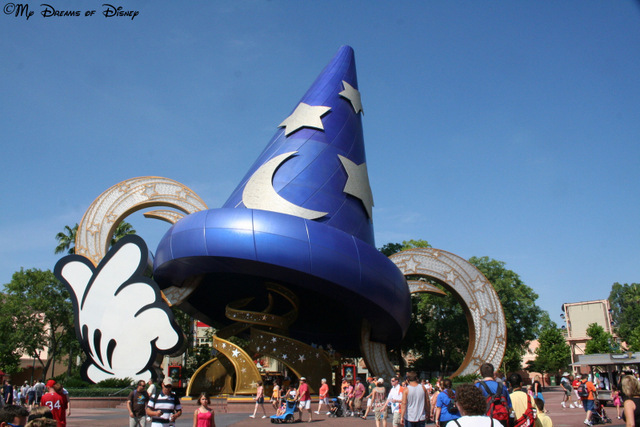 In today’s episode, we’re taking a look at Disney’s Hollywood Studios shows. For our purposes, a show is something on screen or on stage, that you watch as you would watch a movie or play. Beauty and the Beast is the only Disney Movie where the stage show opened on the day that the movie was released to theaters. 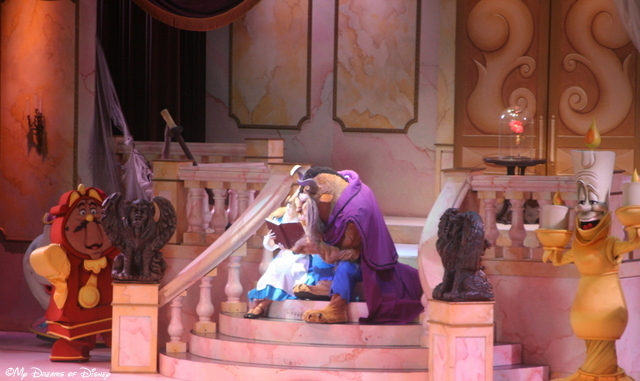 Beauty and the Beast is one of my favorite shows in all of Disney World, and one that I love to see. It has it all, great music, lively entertainment, that wonderfully romantic story that I love, and a happy ending at the end! If you’ve never seen Beauty and the Beast, you are doing yourself a disservice. 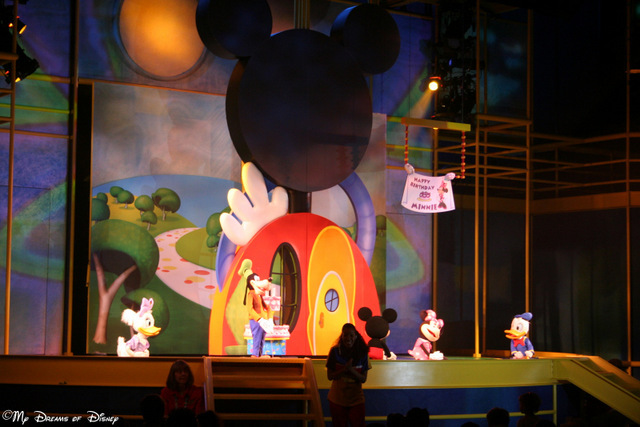 Disney Junior — Live on Stage! This is a new version of a show that we saw when Sophie was younger. When we saw it, it was the Playhouse Disney show, and we had fun with it because it featured a lot of the characters that Sophie was into at the time. We were able to see it with Sophie’s friend Sofie last July, and it was as much fun now as it was then! As I’ve mentioned in a previous post, Fantasmic is actually a show that I’ve never seen before. From what I hear, though, it is an awesome show, and I’m hopeful that we’ll be able to see it this year. Muppet*Vision 3-D is, of course, brought to you by the Muppets, and while extremely corny, I love it! I grew up with the Muppet Show, and to see all of my favorite Muppets on the big screen, in 3-D no less, is really cool. The only thing about it is that it is the same as it has been since the first time I saw it, and I would love it if they would upgrade it. Still, we love it, so I can’t wait to experience it again! I’ve only seen the Voyage of the Little Mermaid a couple of times, as it’s not bad, but often has a really long line so we generally skip it. However, Sophie likes it every now and then, so we see it every couple of years or so. Disney’s Hollywood Studios has some really great shows, and there seems to be something that everyone will love, so take care, and enjoy the shows!